This weekend's heavy rainfall was a welcome sight, but it wasn't enough to end California’s record drought. State officials are still facing tough choices about how to make the low water supply last through the year. But with little water in streams and rivers, declining water quality could be an even bigger challenge, potentially raising problems for drinking water and causing harmful algal blooms. State officials made their first major water quality decision at the end of January, ordering that reservoir operators in Northern California limit water releases from dams. About 144,000 acre-feet of water will be held back this month, water that’s normally required to flow into rivers and the Sacramento-San Joaquin Delta. The freshwater will be used later in the year to keep seawater away from drinking water intakes. The Delta is where freshwater from rivers mixes with saltwater from San Francisco Bay. When there isn’t enough freshwater pushing against the Bay’s tides, saltwater creeps into the Delta, where canals and aqueducts draw water that supplies 25 million Californians. 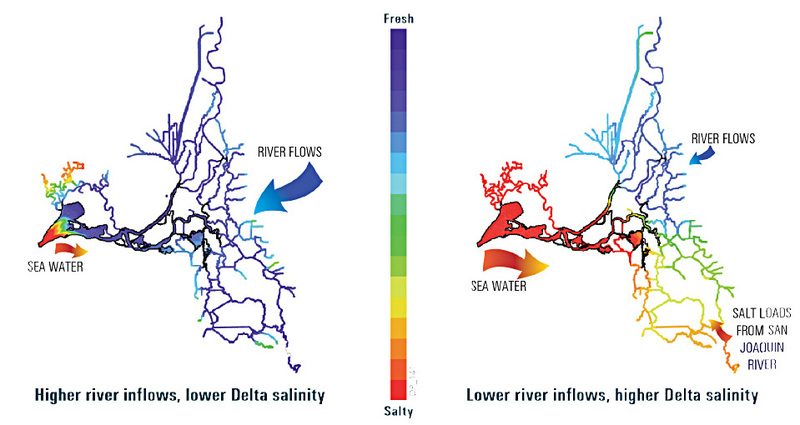 Even beyond saltwater intruding, water quality in the Delta is likely to suffer due to salty agricultural runoff, which is concentrated as the slow-moving water evaporates. Water districts that rely on the Delta for drinking water say it’s a cause for concern. “We’re watching salinity levels very closely,” said Jennifer Allen, spokesperson for the Contra Costa Water District. Contra Costa Water District gets 100 percent of its supply from the Delta and serves 500,000 people in Antioch, Concord, Martinez and Pittsburg. The district withdraws that water through the Contra Costa Canal, which taps into the Delta not far from the saltwater-freshwater mixing zone. During the 1976-77 drought, salt levels in their water exceeded public health limits, prompting water rationing orders. The district has since built the Los Vaqueros Reservoir, which stores higher quality water from the wet months that can be blended with lower quality water coming from the Delta in dry months. That’s something the district normally does, but “what’s different this year is that we’ve notice the salt levels rising earlier than normal,” said Allen. Los Vaqueros Reservoir is in relatively good shape this year, holding 79 percent of its storage capacity. The poor water quality could also reach massive pumps in the South Delta that feed water to the Bay Area, Central Valley and Southern California. That includes Santa Clara County and East Bay cities like Fremont and Livermore. But officials have announced that very little water will be delivered through that system, simply because of the dry conditions. Water treatment plants are built to handle salt, as well as other contaminants like bromide and organic carbon, but poor water quality raises their operating costs. Water quality problems are only expected to get worse with sea level rise, which would push saltwater farther into the Delta. A UC Davis study found that water treatment costs could more than double with a one-foot rise in sea level. Farmers and residents living in the Delta itself also have an eye on their water supply. “We’re concerned about the water quality,” said Mike Robinson of Robinson Farms Feed Company, which grows alfalfa and hay on Roberts Island in the Delta. State officials say keeping water in upstream reservoirs now will allow them to flush it into the Delta later in the year, meeting water quality standards. Those standards are lowered in years that are critically dry. Some water quality problems may not be avoidable. Lower water levels usually mean the water is warmer, which encourages harmful blue-green algae called Microcystis. 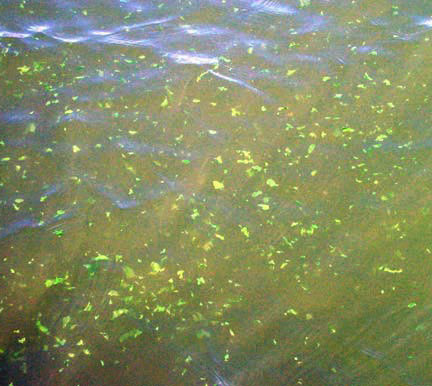 The algae blooms, first noticed in the Delta around 2000, produce a liver toxin that affects people, fish and wildlife. “We expect to see very large blooms if the low flows continue to occur,” said Peggy Lehman, a scientist with the California Department of Water Resources. The blooms normally begin in June or July, but could be seen earlier this year. Harmful effects have been in seen in Delta fish that play a key role in the ecosystem, like threadfin shad. 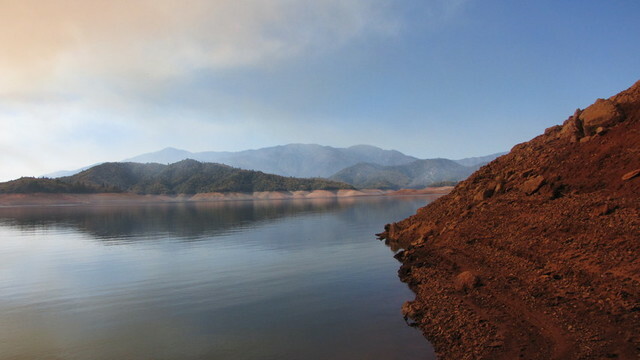 This is the first of two posts on water quality problems caused by the drought. Tomorrow, we look at the impacts on endangered fish and wildlife.